Photo credit: Jerome Turner Cut line: Yvonne Tupper, Salteaux First Nation, and Stewart Phillip, Grand Chief of the Union of BC Indian Chiefs, leave the BC Supreme courthouse following a ruling granting an enforceable injunction at the Site C dam construction area. Land defenders at the Rocky Mountain Camp are now breaking the law for showing physical opposition on the construction area as of midnight Feb. 22, 2016. Land defenders at Site C, location of a proposed hydroelectric dam in north-eastern British Columbia, have been delivered a blow by the BC Supreme Court. An enforceable injunction has been granted to BC Hydro, which will allow construction to proceed unhindered. 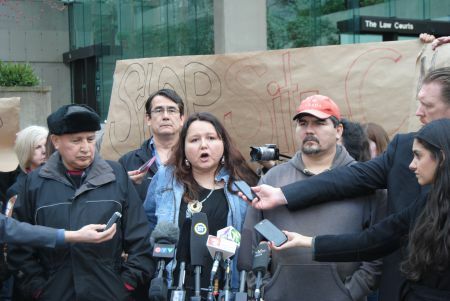 The land defenders became legal defendants when BC Hydro, a crown corporation, decided to take the Rocky Mountain Camp (RMC) and supporters to court. With a ruling in favour of BC Hydro, RMC was given until midnight Feb. 29, 2016 to vacate an area set to be cleared for construction. The decision doesn't surprise Yvonne Tupper, a Salteaux First Nation/Treaty 8 member, who attended the hearing. BC Hydro is aware Treaty 8 territory is federal jurisdiction. They decided to take RMC residents and supporters to provincial court regardless. BC Hydro claims that the Site C dam will power 500,000 or one third of all homes in British Columbia. Opponents of the dam dispute this, claiming that the project will instead be used to power industrial projects. While submitting evidence, lawyers representing BC Hydro argued that an injunction hearing is not the venue to deal with questions of whether RMC land defenders infringed on BC Hydro's ability to complete work. BC Hydro’s lawyers were permitted to use social media postings and video recorded by Site C security guards to prove that infringement of work had, in fact, occurred. Attempts by the defendant’s legal team to strike social media and other evidence as hearsay were denied. Tupper and others set up the camp on New Year’s Eve in the hope that the right to access traditional land, guaranteed by Treaty 8, would be upheld and an injunction would not granted. One of the main reasons for the injunction decision granted by Justice Bruce Butler was the amount of work and money already poured into the estimated $8 billion megaproject. “With nearly $700 million already spent by BC Hydro it is clear that the project is well underway,” Justice Butler said in court, reading from his decision. He cited the 36 authorizations, including logging and rock removal that the B.C. government and its various ministries have granted the crown corporation thus far. “The arguments BC Hydro brought forward to the bench, which were used in the judge's decision, may have applied a decade ago,” Phillip said. A recent pre-trial attempt at a similar injunction against Tahltan land defenders failed to be upheld in the Doubleview v. Day case. In that case, Justice Christopher Grauer heard evidence regarding Doubleview’s legal right to occupy, but also noted in his decision the significant cultural importance of the area to the Tahltan. In the case of the Site C dam, no evidence countering the claims of trespass, nuisance, or prevention of irreparable harm was brought forth by the defendants. Despite the setback, Phillip and Tupper are undaunted. Tupper points to Ottawa for the seeking of future remedy. The RMC plans to regroup and either appeal or focus on the three cases currently seeking judicial review for the granting of permits and the environmental assessment approval.